One of the great triumphs of cold food is the legendary meat sandwich. Call it a hoagie or a hero, this venerable footlong is not at all good for you, but, man, is it good. 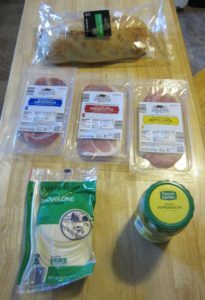 There are other variations on the Italian sub out there, but this is the recipe I ran with. Aldi sells the vast majority of these items. In fact, the only one I wasn’t able to find was red wine vinegar, which I think is occasionally a Special Buy, but it wasn’t available at the time I made the sandwich. Everything else is carried regularly at Aldi. A few of the key ingredients, all from Aldi. The bread was Specially Selected Italian Bread. 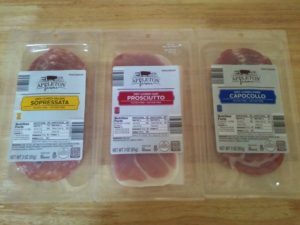 I went with three meats: Appleton Farms Sopressata, Prosciutto, and Capocollo. 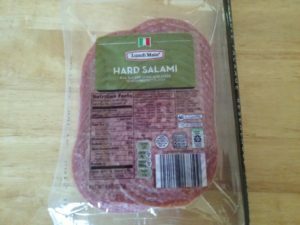 I also used Lunch Mate Hard Salami. For cheese, I went with Happy Farms Sliced Provolone Cheese. 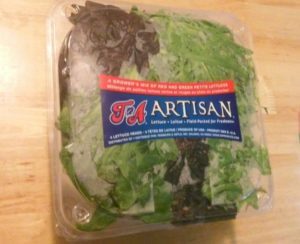 For lettuce, I went with T&A Artisan Lettuce, which comes from Tanimura and Antle Farms, out of California. There isn’t a lot of rocket science to assembling the sandwich. I do recommend that, before you do anything, you slice the Italian bread most (but not all) of the way through, then pull some of the bread out of the inside, making a small hollow space. If you don’t, you’re going to have a very hard time fitting this thing inside your mouth, and an even harder time keeping the sandwich together. Beyond that, you drizzle the red wine vinegar on the bread (1 teaspoon per side). Then, on the bottom loaf, layer the meats, then the cheese, then top with the lettuce, tomato, onion, extra virgin olive oil (1 tablespoon), red wine vinegar (2 teaspoons). Follow this with the rest of the ingredients: salt, pepper, oregano, and Pepperoncini. That gives you a full hoagie. … and Friendly Farms French Onion Dip. 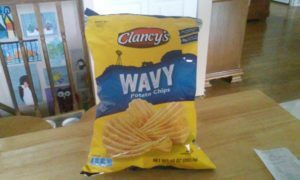 Tastes great. Terrible for you. What about you? 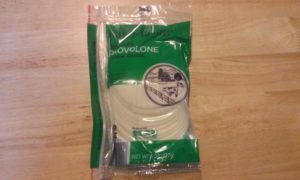 Any sandwich concoctions that you like to assemble using Aldi products? Let us know in the comments! Appleton Farms, Clancy's, Friendly Farms, Happy Farms, Specially Selected, Tanimura & Antle, Tuscan Garden. Bookmark. On New Years Eve, we sampled the Prosciutto and Iberico Ham, both were delicious! We regularly use the sliced provolone, pepperoncini, kalamata olives, and artichoke hearts as well!